Articulate Storyline makes it easy to deploy your content to learners who use iPads and mobile devices that don't support Flash. 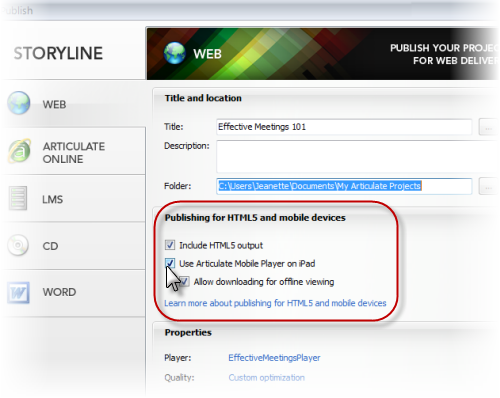 If you choose Web, Articulate Online, or LMS when publishing your Storyline content, you'll see several options on the Publish window. You can choose Include HTML5 output to let learners view content on mobile devices that don't support Flash. You can also choose Use Articulate Mobile Player on iPad to let learners view content on iPad using Articulate Mobile Player, a free app that gives learners the richest viewing experience on an iPad. Anyone can download it for free from the iTunes App Store. Below we answer some common questions course developers ask about publishing for iPad and mobile devices (HTML5). If you're not sure which option you should choose (HTML5 or Articulate Mobile Player) or need other step-by-step guidance on publishing, read our tutorials on publishing for Web, Articulate Online, or LMS. If I Publish for iPad or HTML5, Will My Course Look and Behave Like It Does in Flash? While many of the features in your course will look and behave exactly the same, some may not. Before you design for mobile, review this article to find out how mobile deployment may impact your course. Once I Publish for iPad or HTML5, How Do Learners View My Course? After you publish from Storyline and upload your content to a web server, you just give learners a link to the story.html file. They’ll see the right format for the browser or device they’re using. See this article for details on how this happens. Do Learners Need to Be Connected to the Internet to View My Course on an iPad? Initially, learners must be connected to the internet to view your course on an iPad. However, you can allow learners to download your course for offline viewing once they've added it to their library. See Downloading Content for Offline Viewing. How Do Learners Remove a Course from Their Articulate Mobile Player Library? Long-press any item until an X icon appears in the upper left corner of each course thumbnail, then tap the X icon for each item you want to remove. When you're finished deleting content items, tap anywhere on the screen to hide the X icons. Include HTML5 output when publishing so that learners can use mobile Safari on their iPhones to view content. For more information, see this article. What Publishing Option Should I Choose for Android Devices? When you direct learners to the story.html file in your published course, they'll automatically view the best output for their device and browser. Most Android devices support Flash, so learners will have the best experience by viewing the Flash version of your course. If they're using a browser that doesn't support Flash and if you included HTML5 output when you published, they'll see the HTML5 version instead. See this article for details on how this works. Although your Storyline content may work as expected on Android devices, Articulate doesn't officially support viewing content on Android devices or browsers. Deploy your course from Articulate Online: Articulate Online fully supports tracking users who view your course with the Articulate Mobile Player on an iPad. When you publish, choose Articulate Online as your publish option, and mark the checkbox to "Use Articulate Mobile Player on iPad." Find out more about publishing to Articulate Online here. Deploy your course from an LMS which supports the Tin Can API: Tin Can is a communication specification which allows learning management systems to receive tracking data from mobile apps. When you publish, choose LMS as your publish option, and mark the checkbox to “Use Articulate Mobile Player on iPad.” (If your LMS provider doesn’t yet support Tin Can API, we recommend that you urge them to do so.) Find out more about publishing for LMS here. Deploy your course as HTML5 content, and have learners access it from your LMS with a browser that supports HTML5: This is a good option if you’re using an LMS which does not support Tin Can API and if learners will use an iPad or other device which doesn’t support Flash. When you publish, choose LMS as your publish option, and mark the checkbox to “Include HTML5 output. Find out more about publishing for LMS here. I Don't Need to Track Results. Can I Still Use the Articulate Mobile Player in My LMS Even If It Doesn't Support Tin Can API? It depends. If your LMS doesn’t require a login, your learners might be able to use the Articulate Mobile Player. If your LMS requires a login, learners might not be able to use the Articulate Mobile Player, because browsers cannot pass security credentials to iPad apps unless the LMS supports Tin Can API. You'll need to test your published output in your particular LMS environment if you plan to allow viewing in Articulate Mobile Player.